Recently I was on an commercial air flight and was greeted by a bit of corporate sloganeering that accompanied by meal (yes, you guessed correctly that I was on an international flight). The napkin shouted out in bold blue text, “Planes change. Values don’t. Your priorities will always be ours.“This comes from an airline, and an industry, that has brought us nothing but evidence that customer priorities are very far from their minds. Because of their inability to develop a business model that delivers customer value, we continue to have an industry with marginal to negative profitability that offends customer value at every encounter. Think of cramped seating, checking bags that are a revenue source driving almost open warfare in the cabin over space for carry on luggage. Food has disappeared from most flights with only insulting little packages of peanuts or pretzels. Only after direct government regulation have the pricing schemes gained any semblance of clarity and even the government can’t prevent ongoing incidents of passengers trapped on planes stuck on the ground for hours waiting for a place in the departure queue. This is a wonderful example of behavior many have warned against. Empty words or, worse, words that defies the obvious experience that customers encounter. More than 50 years ago W. Edwards Deming, in his famous 14 Points for Management. called for companies to stop hurling slogans at employees. Deming called for an end to slogans because he correctly saw that the source of poor performance is not to be found in the people in an organization but in the processes and strategies of the business itself. The airline industry does not appear to understand that values are embodied in day-to-day work. 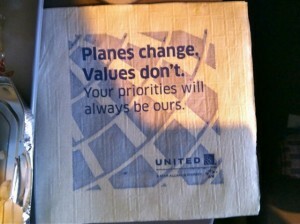 Tossing slogans out will not change how customers experience the actual working of the airline industry. Since then many others have called for managers to put their money where their mouthes are, to walk the talk. People are not taken in by slogans. Now you might be thinking that the nothing of this applies to your small business. But, look around at how you are communicating with your customers and employees. Do your words match up with your actions? This entry was posted in Customer Relationship Management, Marketing/Sales, People, Strategy/Planning and tagged customer priorities, customer value, customers, Deming, employee, marketing strategies, performance, priorities, sloganeering, slogans, strategies, w edwards deming by Mark Orton. Bookmark the permalink.